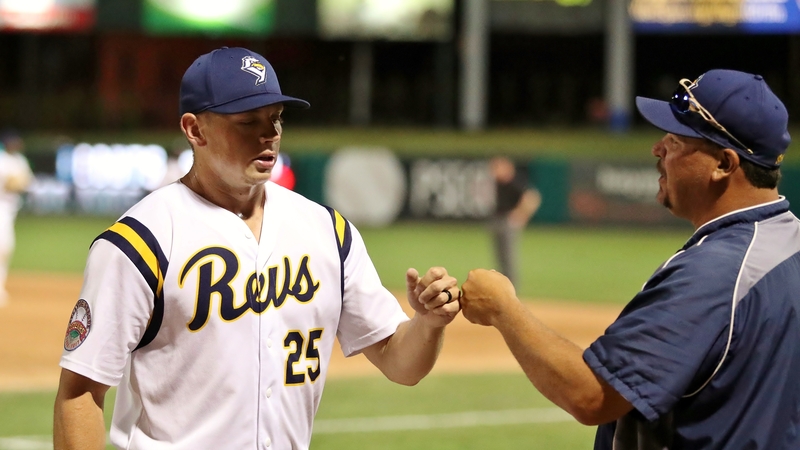 Hard-throwing right-hander Chris Dula who pitched for the York Revolution briefly during the 2017 season has signed with the Milwaukee Brewers, and the signing has gained some national attention. Dula has led one of the more interesting career paths imaginable to this point. An outstanding infielder and hitter at Catawba College in his home state of North Carolina, he had only pitched five innings in three years at that level. Blessed with a golden arm, however, he was a 25th round draft pick of the Texas Rangers in 2013 as a pitcher, and has actually never taken a professional at-bat. Given the lack of time spent as a pitcher in college, it was certainly fair to expect that it would be a bit of a project with Dula to harness that potential on the mound with command having been his biggest challenge. Dula spent four seasons in the lower levels of the Rangers system and spent a few months pitching in Australia after the 2015 season. After one appearance in the Frontier League in 2017, Dula came to York where he appeared in nine games. He allowed just four hits and four runs (three earned) in 8.2 innings but walked 11, plunked four, and issued eight wild pitches. Still, he regularly flashed high 90s readings on the PeoplesBank Park radar gun. Dula landed in the United Shore Professional Baseball League which allowed him the opportunity to continue to work on his own development, and that move has paid off. Dula became one of the USPBL’s biggest stories this past summer by setting, and then repeatedly breaking his own league records for highest velocity recorded… topping out at 102 mph. Wow. Stat-wise, he totaled 49 strike outs in 31 innings for Utica last season. He only allowed 14 hits but walked 39… but when you’re throwing 102, you deserve every chance to find that command. Now it’s the Milwaukee Brewers who will be giving him that chance. It’s a signing that has caught some attention of people throughout the sport this week. The Atlantic League has adopted the new extra innings rule that MiLB instituted last season (read more here). Yes, it’s different, and judging from reaction on social media, it is not something that is immediately well-received by baseball purists. That was also the case with fanbases throughout MiLB when they announced the procedure last season. I am not surprised, and as a baseball purist at heart, I share that same initial reaction. But what I want to point out here is that this is not the Atlantic League being a guinea pig or trying something radical on its own… this was done throughout all of Minor League Baseball last year, all the way up to Triple-A. And while many resisted the idea at first, it ended up being pretty well-received as the season went on, certainly by participants, and by fans as well. It’s too early for any real player movement of note. Signings cannot be made until after the new year, and it will likely be at least late January before any teams announce signings for 2019. Revs Hot Stove Weekly presented by Shipley Energy on WOYK will debut sometime in early February again. But according to Alonzo Harris’ twitter account (always a great source for information), he has signed with Diablos Rojos del Mexico for next summer. Harris is currently playing winter ball in Mexico and recently gained a familiar teammate in Robert Carson who had started his winter in Venezuela, and has since joined him with Mayos de Navojoa. The Revs have traded infielder Steven Figueroa to Gary of the American Association. York added the 23-year-old from the Empire League late last year and worked him into six games. This entry was posted on December 19, 2018 by blogtoblogchamps. It was filed under Alumni Update, Player News, Team News .